In keeping with the theme of slashed blocks, Crafty's second block for January is the wonky pound sign. 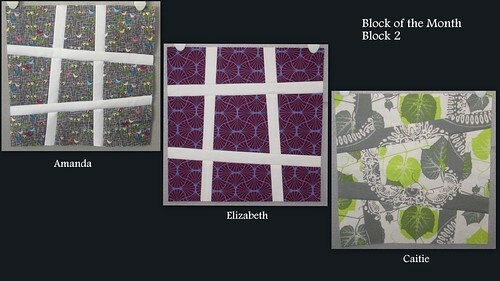 For this block, Amanda, Caitie, and I took a little artistic license. Amanda and I reversed the fabric placement so that the strips are neutral instead of print (as they were in the instructions), and Caitie opted for two prints. This is a very easy and versatile block to make. You could build a whole quilt top with this block, alternating the fabric placement with each block, or making them all the same but allowing the crookedness of the lines to create improv intersections.